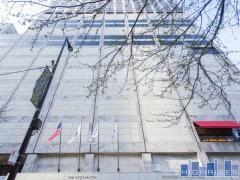 Metropolitan Tower is an historic high-rise condo tower just across the street from Millennium Park. Building amenities include a high-end fitness center complete with steam room, sauna and jacuzzi, a sun deck, guest suites and available garage parking. Have any comments or questions about Metropolitan Tower? Ask your question and/or share your thoughts about this Building. Is this building quiet (no noise transfer from adjoining units.)? Because there are businesses in this building what is done to secure the residences from strangers wandering about? What is the monthly rent for one parking space for a compact auto. ?